Achieve the three elements of food enjoyment! The enjoyment of meals can be greatly enhanced by three things. Firstly; when you know that what you’re eating is healthy and therefore don’t feel guilty about it, secondly; when the food tastes fresh and amazing, and thirdly; when it’s quick and easy to prepare! 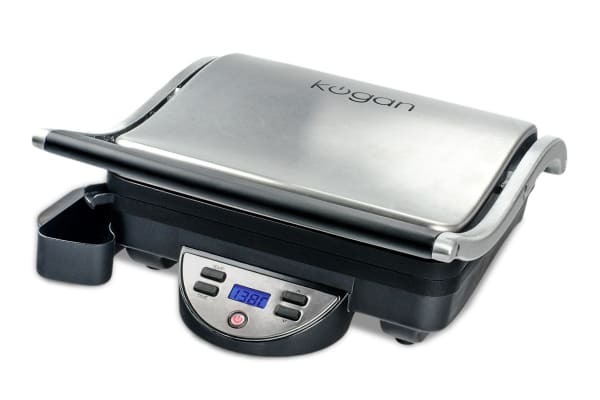 The Kogan Smart Grill & Sandwich Press is the one appliance you need to achieve the magical three elements of food enjoyment! 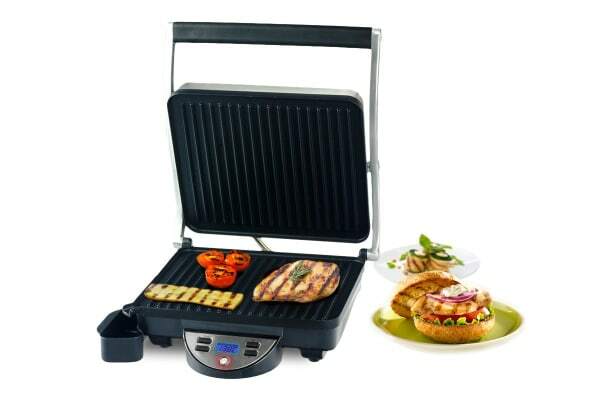 This great value Grill & Press lets you cook a variety of foods in the easiest and healthiest way possible, all while retaining the fantastic flavours that you love. With our Smart Grill & Sandwich Press, you can grill anything from meats to vegetables to panini style sandwiches. You’ll barely need the rest of your kitchen! Unlike other sandwich presses and grills, the Smart Grill & Sandwich Press allows you to set the exact temperature you require and adjust it at any time for optimal grilling. A green light indicates when your desired temperature has been reached. This means you can follow recipes to the letter and learn which temperature settings to use for certain foods. To keep your foods healthy and fresh, the Grill & Press features a gently sloping surface, so that any fats and oils drain away from the food and into the included drip tray, where they can easily be thrown away. The Smart Grill & Sandwich Press isn’t called ‘smart’ for nothing! The LCD display not only shows the temperature setting, it also allows you to set a timer for the food you’re cooking. No more burnt meals – you can walk away and forget about your food until the timer alarm sounds and your food is perfectly cooked! A pleasure to use, the Smart Grill & Sandwich Press is constructed from the finest stainless steel and bakelite. 1800W power for serious cooking. This has yet to be proven & i hope it lasts longer than the previous purchase! If the power cord was any shorter it would be an "innie" rather than an "outie".